My mom and siblings are in California. My grown up children are in Illinois and Wisconsin. It’s difficult to get together very often, and I miss them all tremendously. This summer, I started a photo sharing project on this blog in order to review my memories and convert my snapshots into digital format that everyone could copy and store. It’s taken a lot of screen time and yielded some powerful emotions. In the last installment, I posted photos from 2007 which included my daughters’ graduations and our last family reunion at the beach cottage in Michigan. My husband was quite ill. In January of 2008, the day before our 24th wedding anniversary, I treated myself to a trip to our Cancun timeshare resort with my oldest daughter and my brother. Jim was not up to international travel, but did end up going to the East Coast to visit his sister and his nephews. A couple of weeks later, he was having another heart surgery. Ten days after returning home from the hospital, he died in his sleep beside me. My mother flew out immediately to help me cope with logistics, and we planned a memorial celebration to take place three weeks later. 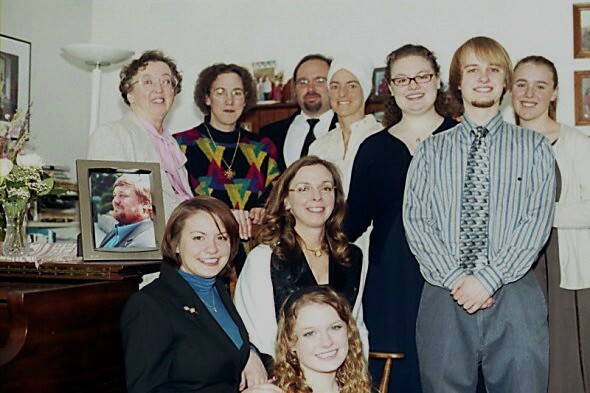 I gathered family groups around the piano in the living room for photographs that afternoon. Here’s the Heigho bloodline: I was very sorry to see my mom and siblings board the plane for their return flight and my son and middle daughter return to college shortly after the ceremony. I was not looking forward to a painfully empty nest. My youngest daughter and I went out to California in August for my birthday…and Jim’s. I revisited the places where we met, fell in love, and were married. I felt like one small fraction of a person; being with the people who knew me longest and best helped. Emily, my mom and I also took a tour of the Winchester Mystery House. It was the first time I’d been inside. Who knew it’d figure in our family history seven years later…? This entry was posted in Family, Memoirs and tagged family photo album, grandparenting, memoirs, The Grandparent Project. Bookmark the permalink. Thanks, Meg. I had no idea when I started how many posts it would cover. Kind of like the endless boring family vacation slide show, I feared. Never a more urgent time in history for us all to acknowledge and appreciate the strength of individuals, and the impact of family.